"A delicious ravioli filling for fresh pasta." Heat the olive oil in a large skillet over medium-high heat. Cook the spinach until fully wilted, about 2 minutes. Let cool, then squeeze the spinach to remove as much liquid as you can. Combine the cooked spinach, feta, and pine nuts in a blender or food processor and pulse until it is the consistency of a fine paste. Beat the egg and water together in a small bowl. To assemble the ravioli, brush the egg over a sheet of pasta. Drop the filling mixture on the dough by teaspoonfuls about one inch apart. Cover the filling with the top sheet of pasta, pressing out the air from around each portion of filling. Press firmly around the filling in whatever shape you wish (circles, squares) and then cut them apart. Press the tines of a fork around the edges of the pasta to seal each raviolo. Fill a large pot with lightly salted water and bring to a rolling boil over high heat. Once the water is boiling, add the ravioli, stir gently, and return to a boil. Cook uncovered until the ravioli float to the top and the filling is hot, about 3 to 5 minutes. 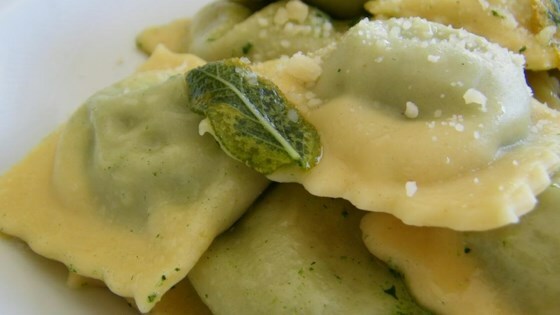 For step-by-step instructions on how to make ravioli, see our Making Ravioli article. Love it! This filling was awesome. Followed recipe exactly. Made this with friends for New Year's Eve and served coated with Pesto. It takes some time to prepare but well worth the effort. Delicious! I followed this recipe and added shrimp to the filling.... This was so good that my 3 year old even loved it! These were incredible! I used walnuts instead of Pine Nuts since I hate "Pine Mouth". Served them with a walnut, cream sauce. AWESOME!